Drummondville, QC, May, 2018 — Kimpex, in association with ProTaper products, of which we are the exclusive distributor in Canada, is proud to support the MX Rockstar Energy OTSFF Yamaha team for the 2018 season. 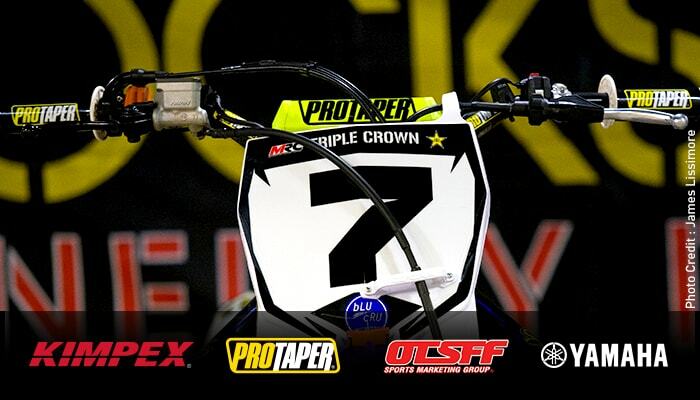 This year, as a result of a new partnership, the motocross team will be able to rely on ProTaper products. Founded in 1991 in California, ProTaper now designs innovative products to meet the needs of motocross sports enthusiasts and professionals. Handlebars, footrests, chains and sprockets: with ProTaper, every detail counts to improve the motocross driving experience. Making their mark on the national MX scene, team Rockstar Energy OTSFF Yamaha is keen to undertake the second stage of the Rockstar Triple Crown circuit in May. Last year's outdoors champ, Matt Goerke is back on track this season to defend his title. He is currently in 3rd position after the first round of Arenacross in the 450 series, while his teammate Dillan Epstein is 5th. Already ranked among the leaders, both of these athletes promise to deliver thrilling performances for the rest of the season! Contributing to the recognition of the motocross sport in Canada is a priority for Kimpex, a leader in the distribution of parts and accessories for power sports. It is therefore with great enthusiasm that we will follow the team’s course on the national circuit in 2018. In the quest to win on tracks across Canada, Kimpex joins ProTaper to wish Rockstar Energy OTSFF Yamaha team a most electrifying season!